I'm laser-focused on finding my 4th great-grandfather Burr Zelah Dornon's grave. I believe he rests eternally in a cemetery somewhere in Lawrence County, Ohio or across the river in Jackson County, West Virginia. I've been so focused on that search, though, that I've neglected another 4th great-grandfather, John Benedick, who's closely linked to Burr. According to the U.S. Federal Census, John was a stone cutter in 1850 and a farmer in 1860. We also know he was an active supporter of the Whig Party's presidential candidate in 1840. Celebrating her 90th birthday in 1899, John's widow Mary Ann (Miser) Benedick reflected on "the years of her young womanhood when history was being made so rapidly during the middle of the century." She recounted for the local newspaper how she and her husband helped host a dinner in their Harrison County, Ohio orchard for General William Henry Harrison during his campaign for president (Tippecanoe and Tyler Too). 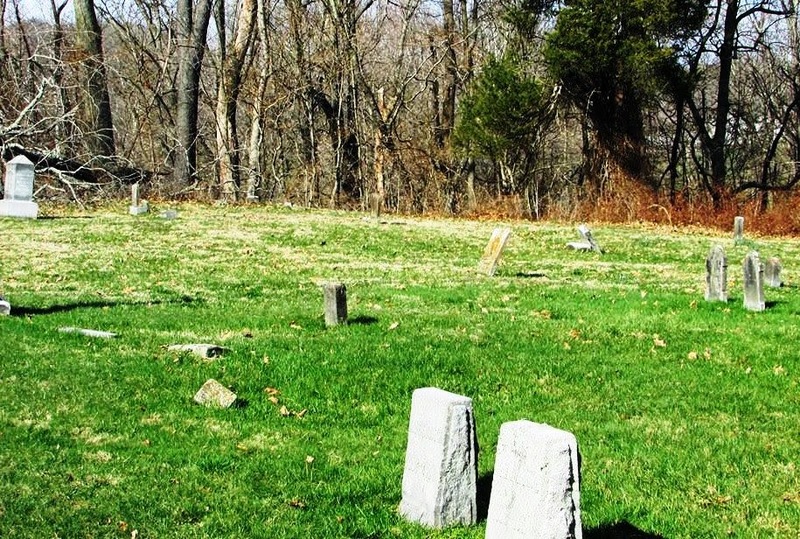 Unlike Burr, I know where John is buried His grave was documented in a survey of Miller Cemetery burials in Lawrence County. Curiously, John died in May 1863, which is very near to the time frame I speculate that Burr died. But that's not all they share in common. Two of Burr's daughters married two of John's sons, including my 3rd great-grandparents Albert and Anna (Dornon) Benedick. These links made me eager to see a photograph of John's headstone. I submitted a request several years ago through FindAGrave.com. Unfortunately, the request was never taken up. Until this week. 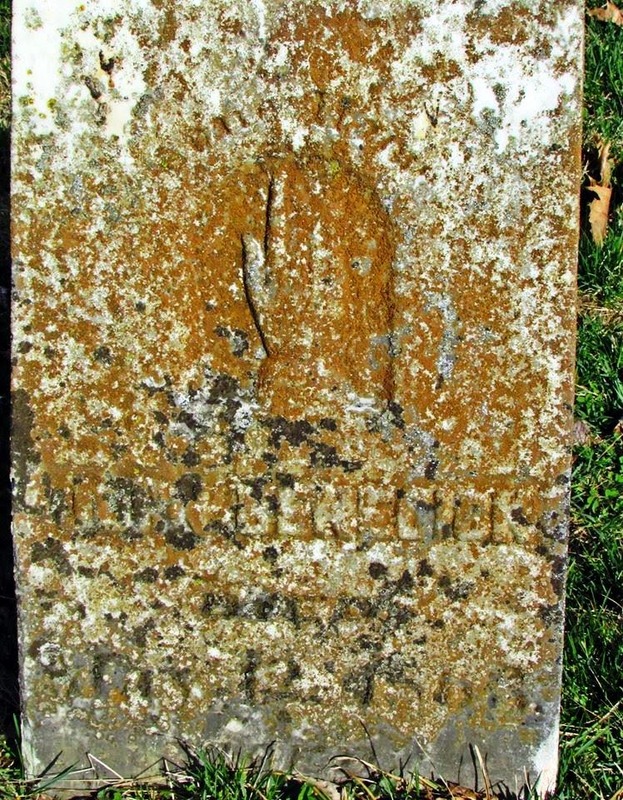 Carl Murdock, an administrator for the Lawrence Register - a Facebook group dedicated to Lawrence County genealogy - trawled through Miller Cemetery and found the weathered headstone. After more than 150 years, the stone is still upright. John Benedick's stone pictured center. Photo by Carl Murdock. Used by permission. Time has taken its toll on the memorial; it could use a gentle cleaning. The inscription is worn and hidden behind rust-colored lichen, but the name is still visible. The hand pointing heavenward still attests to his faith. John Benedick. Photo by Carl Murdock. Used by permission. The existence of John's headstone, after all these years, is encouraging. Perhaps Burr's stone may still be out there waiting to be rediscovered. My search continues, but, in the meantime, I honor an ancestor at rest and am thankful that his marker still has its place.